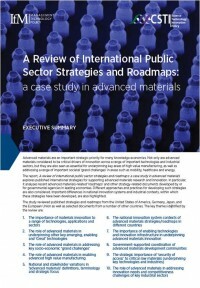 This report, A review of international public sector strategies and roadmaps: a case study in advanced materials explores published international strategies for supporting advanced materials research and innovation. In particular, it analyses recent advanced materials-related ‘roadmaps’ and other strategy-related documents developed by or for governmental agencies in leading economies. Different approaches and practices for developing such strategies are also considered. Important differences in national innovation systems and industrial contexts, within which these strategies have been developed, are also highlighted.